Today we’ll look at a couple of graphic affects in Cabnetware that some people feel they have no control over. It turns out that some advanced Windows settings affect the graphic behavior of the program. Windows Vista and Windows 7 have some controls for this. One thing that some people report is a shimmering or flickering effect when viewing an elevation while in a non Classic display mode. This is apparent when the Tool Tips feature is turned on. 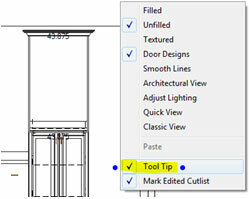 Tool Tips can be turned off on elevations by doing a <RB> mouse click off to the side of the wall and un-checking Tool Tip. Tool Tips is a very useful feature that may be nice to keep on. It seems that most people don’t notice this affect while running Windows 7 or Vista and there is a default setting that eliminates this graphic affect. 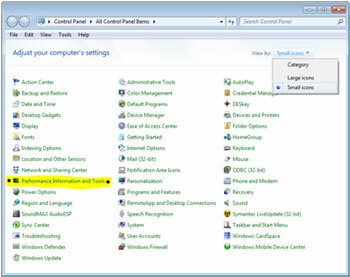 Find this setting by going to Control Panel. Click on the Small Icons choice in ‘View by:’ and then select ‘Performance Information and Tools’. Then select ‘Adjust visual effects’. 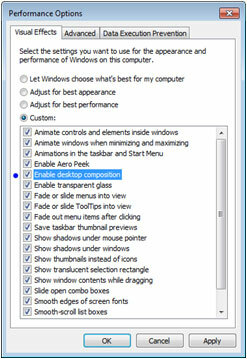 If the check box is on next to’ Enable desktop composition’, the elevation viewed with Tool Tips on is stable. Another thing some people report is that when they use the File menu choice to Export Bitmap…, they see the export dialog box superimposed on the exported view. This seems to be a speed issue in that the dialog hasn’t faded out yet when the bit map is generated. This is alleviated by un-checking a setting in the Visual Effects dialog. 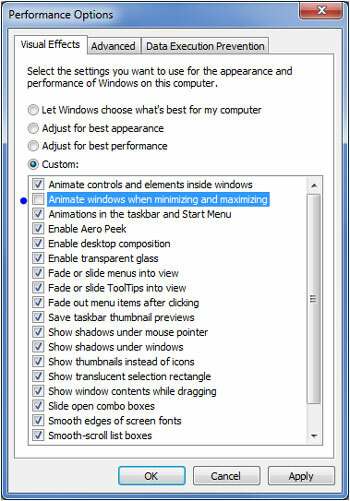 Uncheck ‘Animate windows when minimizing and maximizing, to clear up that symptom.